Prominent & Leading Manufacturer from Mumbai, we offer elevator flat cable. Relicab Cable Mfg. Pvt. 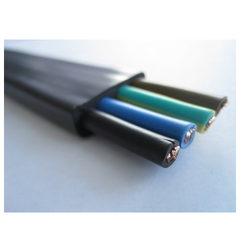 Ltd. Manufacturers of Elevator Flat Cable introduce Ourselves as an ISO - 9001:2008 Certified Company, We also manufacture various Wiring Harnesses and supply the same to many reputed companies since 1986. We have developed 12 core and 16 core elevator cables using special PVC compound which Is highly flexible and with bouncing effects. The cores are situated in adjacent groups and each group permits easy opening of jacket for installation. The said cable can be your import substitute with ready delivery at competitive price.